All competitors are required to be current members of USSA and hold a current USSA alpine competitor license in order to compete in USSA scored races. 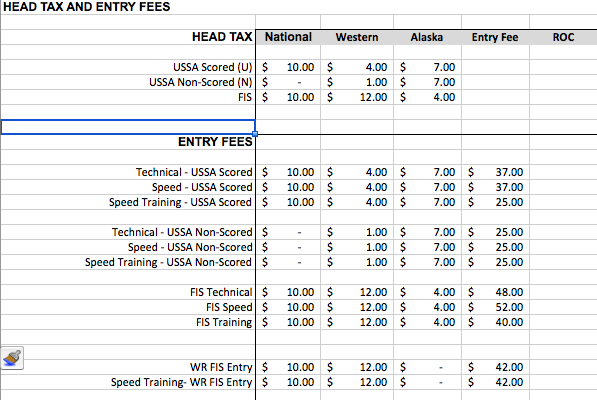 Alaska Division alpine competition follows the USSA grouping system. Classification ages are based upon the age of the racer as of December 31 of the current season. Some restrictions apply to specific age groups. A description of the age grouping system can be found in the USSA competition guide. An athlete’s divisional and national financial obligations must be paid prior to the athlete’s departure for an out-of-division or championship competition. on the Alaska race calendar or as noted by host club race announcement. Please note: These are maximum entry fee guidelines for races. Organizers can choose to charge less per start. Entry fees are set by the Division ACC. Late entries may be accepted depending on the sponsoring club’s published policy. If a racer wishes to withdraw from a race, entry fees will be refunded only when notice is given to the race secretary prior to the draw at the team captain’s meeting of the race in question. If a DH or SG is canceled, the organizing club may keep the entire training fee if a training fee has been set and included in the race announcement. If a SL or GS is canceled, the organizer will refund the entire entry fee. Refunds will be mailed out within 30 days. All host clubs will be responsible for sending out pertinent race information such as the schedule, field size limits, lift fees and area releases to all USSA Alpine clubs within Alaska, no less than 30 days prior to the scheduled event. The host club will issue racing bibs. The host club may charge a bib deposit at race registration or a fee for a lost bib or a bib returned late. Host clubs of divisional qualifiers will generate overall results that include the age group and second run times for each racer. Overall results will be posted to the Alaska Division web site within 72 hours of the completion of that event or series. Out-of-division athletes are welcome and invited to participate in all AK Division races at all age levels. For all State Championship events (Alyeska Cup and U12/14 State Champs), only Alaska Division registered athletes are eligible for State Championship awards. Racers will be selected to attend these events according to the policy for out-of-division travel. Selection is based on the National Team Selection Board (NTSB) using U.S. Ski and Snowboard seed points from the most current list on the selection date. The NTSB method is described in the U.S. Ski and Snowboard Alpine competition guide. Western Region automatics will not appear on the board. For Speed Series a modified NTSB board will be used, in that GS will always be the last pick on any line. Athletes must meet Alaska eligibility rules. Selection Boards will include only the events to be held at the Series, with the exception that Speed Events Series boards will also include GS. For the 2019 season two race series will be used for Head to Head rankings – The December 15-18 FIS Tech Open Series (3-SL, 2-GS) and the February 21-24 NCAA FIS Tech Series (2-SL, 2-GS) both at Alyeska, Alaska. For the 2019 WRJC U19 selections, naming the team shall be accomplished by utilizing a five-column selection board. Each column shall be comprised of eligible athlete names ranked first to last. The first ranked athlete shall be placed at the top of the column; the last ranked athlete shall be placed at the bottom of the column. LEFT COLUMNS will be comprised of athlete names ranked by each individual athlete’s current FIS points for GS, SL and SG. DH shall not be considered. RIGHT COLUMNS will be comprised of athlete names ranked by each individual athlete’s best two (out of four) GS and best two (out of five) SL race finishes at the qualifying race series. Finishes shall be scored using new World Cup points. Ties shall be broken using the next best result. SELECTION is accomplished by taking the top name in the FIS GS Points. column, then the FIS SL Points column, then the FIS SG Points column, followed by the top name in the FIS GS Race column, then the FIS SL Race column. Selection continues by going to the second name in the left columns, and then the second name in the right columns, etc and by following the procedure described in the previous sentence until the team is filled. If a name comes up a second time it is skipped. Always skip across from left to right, not down for repeats. In the event that we are unable to hold three (3) Slalom or (3) Giant Slalom races in the qualifying series, head to head results will not be used to make selections. The Alaska Division quota for the 2019 Western Region U16 Championships is 5 women and 5 men. The quota is determined by the Corrock Method which factors each Division’s’ population and team results at the regional championship from the prior year. For the 2019 season two series will be used – Coca Cola Classic Cup January 12-15, and Alyeska Cup February 7-13. The races contested will be 2 GS and 2 SL from Coca Cola Classic, and 2 SG, 2 GS and 2 SL from Alyeska Cup. In the event that we are unable to hold three (3) Slalom or Giant Slalom races, due to circumstances, qualification will be done using each “run” vs. “race.” In the event that qualifying series has to be reduced to 4 or fewer races, qualification will be done using each “run” vs. “race.” In qualifying GS and SL races, racers that are not ranked after the first run (DNF’s or DQ’s) will be allowed to run at the end of their respective seeds (groups of 15) in reverse bib order during the second run. This is to insure that if qualification races are lost each competitor will have had the opportunity to complete each run if qualification reverts to “by run” versus “by race” results. For purposes of the selection board, the racer with the highest number of points based on their five best race/competition finishes (with no more than three “races” or “runs” used in any discipline), will be ranked first. Each racer thereafter will be ranked in accordance with the number of total points accumulated in the best five “races”, with no more than three “races” or “runs” used in any single discipline. Ties in ranking will be broken by using the next best race finish per discipline, not to exceed using more than three “races or runs” in any single discipline. Selections will be made by the ACC. Programs or independent athletes will be notified of team selections no more than 48 hours after they are determined. Athletes must notify their club of their intent to participate and submit a trip deposit payment, within 48 hours after selections are announced. Selections will be made as described above until each quota, including alternates, is filled. The Alaska Division quota for the Western Region U14 Championships is subject to change annually. The quota is determined by each Division’s population from U14 USSA license holders who are current on the November points list. The Alaska Division has a minimum quota of 4 women and 4 men for the 2019 U14 WR Championships. The qualifying races contested will always include two Super G races, two Giant Slalom races, and two Slalom races. For the 2019 season two series of races will be used – Coca Cola Classic Cup January 12-15 and Alyeska Cup February 7-13, both at Alyeska, Alaska. Each run of the ten races will be a qualifying event for the selection boards. The events contested will be four GS runs and four SL runs from Coca Cola Classic Cup, and two SG runs, four GS runs and 4 SL runs from Alyeska Cup. For purposes of the selection board, the racer with the highest number of points based on nine best runs, (with no more than five runs used in any discipline), will be ranked first. Each racer thereafter will be ranked in accordance with the number of total points accumulated in the best nine runs, with no more than five runs used in any single discipline. Ties in ranking will be broken by using the next best run finish, not to exceed using more than five runs in any single discipline. Selections will be made as described above until each quota, including alternates, is filled. Selections will be made by the ACC. Programs or independent athletes will be notified of team selections no more than 48 hours after they are determined. Athletes must notify their club of their intent to participate and submit a trip deposit payment, within 48 hours after selections are announced. Intermountain, Northern and Alaska Division share a championship for athletes not making the U16 or U14 Regional Championship quotas for their division. Quotas are determined by population of participating divisions. The regional selection boards for each age group, U16 and U14 described above, will be used to determine quotas. Athletes may participate in their respective Regional Championship OR Tri Divisionals. Athletes may NOT attend both. The winner of the first event in each discipline at the Alyeska Cup for the U16 and U19 age classifications, will be designated the Alaska state champion in that discipline. The first race of each discipline is used for the Alyeska Cup. WC points are awarded for each of three races (1SG, 1GS, 1SL), and only athletes that finish all three events will be eligible to win. Up to 20 percent or 1 quota spot (whichever is greater) of any Alaska divisional quota may be allocated to discretionary selections. The use of this discretionary quota shall be the decision of the ACC. Petitions for exceptions must be made in writing, including supporting documentation, to the Coaches Working Group by the protest period of the final selection race. Approval of exception and inclusion into the quota shall be made by a majority vote of the ACC. A minimum of first through fifth place awards shall be given for each gender and class for each race. First through fifth place overall awards shall be given for each gender and class and will be based on the total points accumulated for each run of both events. Scoring will be based on the New World Cup Points method, with each finisher awarded at least 1 point. In the case of a tie for the overall scores, the lowest combined finish placing will break the tie. If there is still a tie, the lowest combined race time will be used.